The third of the conventional Sonic the Hedgehog games for the Master System. This was the game that delivered on the promise to have Tails as a playable character, after many were left disappointed when he appeared only as a non-playable character in Sonic the Hedgehog 2. Even with the addition of Tails though the game manages to disappoint, it's only a 1 player game and Sonic and Tails are only playable separately, featuring none of the tag-teaming/co-operative action to be found in the 16-bit series from the second game onwards. Unfortunately there is also something lacking in the gameplay. Technically it's by far the superior of the Sonic platform games on the Master System, so why isn't this the pinnacle of the series? Aside from a graphical make-over and Tails being playable, there isn't much new that improves on the already successful formula. The aim is still to find the Chaos Emeralds and defeat Robotnik. This time he has stolen the red Chaos emerald amidst the confusion of a cataclysm that rocked South Island. It's up to Sonic and Tails to find the missing emeralds and recover the red Chaos Emerald from their arch enemy, again. Not that you'd know any of this from the game, it's all explained in the manual only; as with the previous games there's no narrative in-game to follow except for a short scene showing Robotnik flying off with his stolen prize. 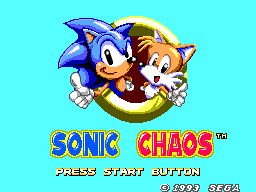 After the title screen choose either Sonic or Tails to play as, the first a fast, blue hedgehog and the second a fox that can fly using his two tails. There are six zones with three levels to a zone. This game's structure is very much the same as the previous games. 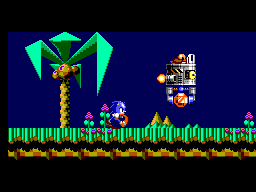 The first two levels (acts) per zone are regular levels where the aim is to collect rings, look for the Chaos emerald and reach the end, the third act in every zone being the boss battle, and all are tackled in a linear manner with no backtracking. But there are slight differences this time around. Instead of accessing Bonus Rounds at the end of a level, you can now only access them as Sonic and that occurs automatically when 100 rings have been collected in a level. This is also how Sonic can find the Chaos emeralds - no longer hidden in the levels themselves, they're at the end of each bonus level. If playing as Tails then it's a different matter, no bonus levels for him or Chaos emeralds to be found in his game. 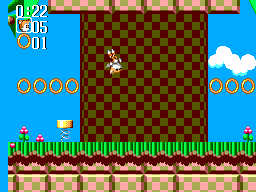 Sonic's game requires more exploration to find enough rings to access the bonus levels while Tails just has to get from A to B without dying too much. This is the main criticism that I have with the game. It's far too easy and too much of the game is derivative. If you choose to zip through the levels then it can be completed in less than 30 minutes, easily. Most levels take only 20 to 40 seconds this way. There's no challenge and it's all over and done with too soon. On the other hand, if you choose to find the Chaos emeralds, then ... well you'd expect a whole different matter, but no, finding them is only a matter of collecting 100 rings and that's easy enough, the bonus levels containing the emeralds are incredibly simple, easy and short too. Whichever way the game is tackled it's a breeze. The bosses are also far too easy. The first can be destroyed in seconds just by rolling into it repeatedly, the second and third by jumping against them repeatedly, the fourth and fifth by bouncing on them repeatedly. It isn't until the very end of the game that things get tough. The first two games had their own fair share of easy boss battles, but they also had several challenging ones that I would rather have seen repeated in Sonic Chaos. The difference between Sonic's game and Tails' game is very small and could have been done better here. Sonic can reach every area of every level that Tails can, and vice versa. It was a sorely missed opportunity; the addition of Tails should have been a worthwhile one. If only the game provided enough fun I wouldn't have minded so much. Some of the individual moves for each character are fun - mostly Sonic's dash moves - but Tail's ability to fly should be something special, instead his flying is slow and the distance he can travel is very short. The design of the levels could have been used to highlight each character's individual abilities, and that this didn't happen just makes the developers look lazy and disinterested in their own game. The levels, however, are a mixed bag in other respects. The opening zone looks great with familiar sights dotted around the levels: palm trees return, the loops are back and more fun than before, and a moebius strip (or "corkscrew" strip) makes a cool appearance, the rings spin mid-air while enemies patrol, the item boxes are present too. Everything is present for what should be a fun game, except the placement of it all isn't done well. Everything is bright and colourful, everything looks great. Oh, except one thing. The backgrounds are lousy and barely noticeable. But if they're not noticeable then it doesn't matter too much, they just could have been done a lot better to give the player a better sense of this being Sonic and Tails speeding around an island full of sights instead of just offering a sense of going from platform to platform while collecting some things and avoiding others. Getting back to the good points of the graphics, though, the sprites are nice and the animations for them all are smooth and impressive, especially for a game where a lot can be happening on screen at once. Sonic's own look has been slightly altered from that in his previous adventures, the shading is more striking and he does come off as more animated and with more attitude. The graphics are by far the best thing about Sonic Chaos. The sound in the game isn't amazing but neither is it bad. The tunes throughout the game are all catchy and suit the mood of whichever part they appear in. There are also plenty of them. The same can be said for the sound effects, because from the chime of a ring being collected to the sound of Sonic going into a spin everything is done well and fits perfectly with what's happening on-screen. Albeit a bit mundane, there are no real faults with the sound effects or music. These are very simple, as they always tend to be for Sonic games. The D-Pad moves each character around while buttons 1 and 2 take responsibility for jumping, flying, spin-dash etc. It's worth noting that the controls are very responsive and easy to handle. On a personal level I find no reason to play through the game with each character more than once, despite there being two endings for Sonic, the probability of not finding the emeralds for the good ending are remote. Nor is the game enough fun to warrant many replays. However there is the point that with the game being as aesthetically pleasing as it is, replaying the game for the sake of viewing it all again could be worthwhile. Overall it is a good game, it can be fun, but its good points are mostly cosmetic. It looks and sounds great but it can be completed without breaking a sweat and in a very short time, all while being shallow when it should have been the best Sonic game on the system. If the level design hadn't been so lazy and uninspiring, seeming like every level was thrown together to meet an approaching deadline, and there was more incentive to put time into both characters, then I think this would have been the best of the series. As it is, Sonic Chaos is the most immediately appealing of the series on the Master System, but in practice the one least worth playing.